These refined sugar and gluten free cookies will soon be your new best friend. Ready in just a few minutes, with easy to find ingredients. Preheat oven to 350 degrees and prepare a baking sheet with either a Slipmat or parchment paper. In a food processor, process the almond butter, dates vanilla, cocoa powder and egg. Using a small cookie dough scoop, roll into balls and gently press them flat with the tines of a fork. 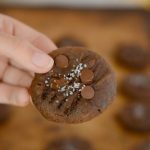 Press about four to five chocolate chips onto the cookie and sprinkle with sea salt.